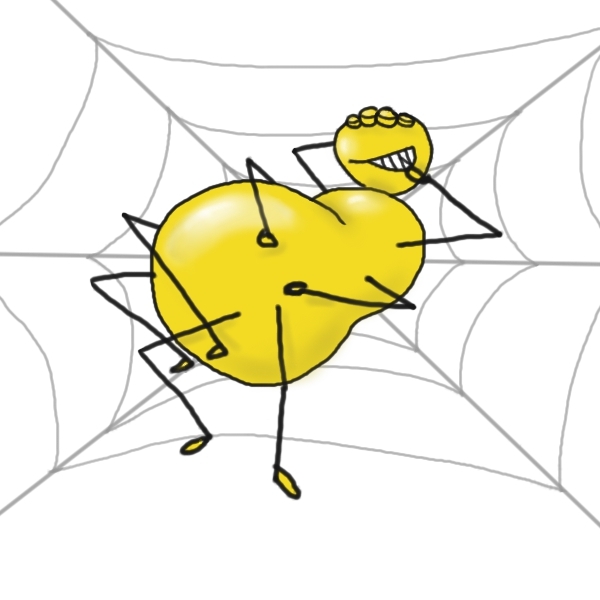 The yellow, fat spiders that are quick and smart | Random moosages as I see fit. The other day, a friend was commenting on how the weather was starting to warm up. She said that the spiders were aplenty and the birds were starting to sing…and some other stuff. Obviously, I fixated on the spider portion of her comment. So I asked her what kind of spiders were becoming so plentiful. She said “the yellow, fat spiders that are quick and smart.” And…the doodle I presented above is what immediately came to mind. I don’t know if that spider is quick or smart, but it is yellow and fat. Relatively fat. I mean, he has a gut. He’s not obese or anything. I suppose if he keeps eating like he has been, he’ll become so. I guess that means he has to be smart too, then. I’m assuming that he’s using his ingenuity to catch bugs and such. And his ingenuity will probably help him more than being quick, because I doubt that he’ll remain quick much longer if he keeps eating at the same rate.